MLB baseball player David Allen Wright (born December 20, 1982 in Norfolk, Virginia) is an American former professional baseball third baseman who played his entire 14-year Major League Baseball (MLB) career for the New York Mets. He was drafted by the Mets in 2001 and made his major league debut on July 21, 2004 at Shea Stadium. Wright was nicknamed "Captain America" after his performance in the 2013 World Baseball Classic. 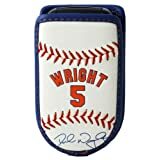 Wright is a seven-time All-Star, a two-time Gold Glove Award winner, a two-time Silver Slugger Award winner, and a member of the 30–30 club. He holds Mets franchise records for most career runs batted in (RBIs), doubles, total bases, runs scored, walks, sacrifice flies, times on base, extra base hits, strikeouts, double plays, and hits. He was named captain of the Mets in 2013, becoming the fourth captain in the team's history. Throughout the latter half of Wright's career, he was plagued by injuries, most notably spinal stenosis, as well as additional ailments in his neck and shoulder. After missing significant time from 2015 to 2018 and receiving word from doctors that his spinal stenosis would not improve, Wright announced that 2018 would be his final season as an active player. Wright finished his major league career with a .296 career batting average, 242 home runs, and 970 runs batted in. Upon completion of his playing career, Wright was named a special advisor in the Mets front office. David Wright was brought up in Chesapeake, Virginia. A man of Italian descent, Wright attended Hickory High School in Chesapeake, Virginia. In high school, he was a three-time All-State selection and, as a senior, was named the Virginia All-State Player of the Year. He finished his high school career with a .438 batting average, 13 home runs, and 50 RBI. Although Wright had signed a letter of intent before his senior year to play baseball at Georgia Tech after high school, he opted to enter the draft when it became apparent he could be selected in the first round. Wright, along with shortstop Jose Reyes, combine to make one of the best young duos on the left side of the infield in the Majors. 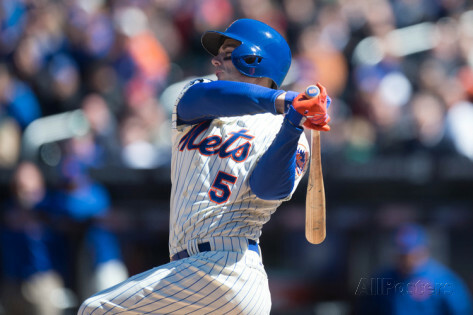 David Wright is ranked second among third basemen in ESPN fantasy baseball, behind the cross-town New York Yankees counterpart Alex Rodriguez. 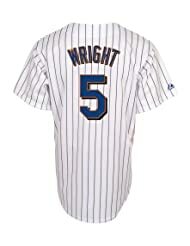 For 2007 and 2008, Wright hit over .300, scored and drove in more than 100 runs, and topped the 30 home run mark. Impressive by any standards. Below are his stats. For his career stats, click here. Though his power numbers were down considerably in 2009 (10 HRs, 72 RBI), he finished the season with a respectable .307 batting average, 39 doubles and 27 stolen bases. 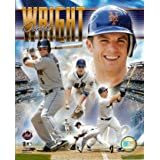 Featured here are David Wright posters, photos, giant collectibles and apparel.